Georgette Kanach of Gray, Maine is an artist who creates masterpieces that embody the natureal beauty of her great state of Maine. 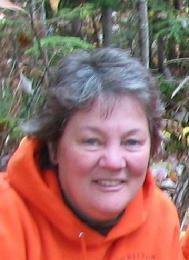 Born and raised in Jackman, Maine, Georgie is a self taught artist, with over 40 years of experience. Her lifelong love of nature is truly demonstrated in all her many works of art. Georgette's artwork spans the range from two-dimensional paintings to relief carving, air brushing and jewelry making. She works with natural mediums such as wood, antler, feathers and eggs as well as glass, metal, and automobiles, not to mention conventional paintings in oils and acrylics. Her hand-carved wood railings and mantelpieces are a specialty that adorn many beautiful homes. Georgette has been honored with numerous ribbons for her Egg and Wood relief carvings. Winning first place in the State of Maine Duck Stamp contest in 2009 has opened many doors in further oportunities as well as Ruffed Grouse Society Artist of the year with her painting "Autumn Delight". Her achievement as Master Maine Guide was truly inspired by her desire to share her love of nature. Georgette now works in her studio in Gray,where she enjoys creating one of a kind pieces. And sells her art out of her Gallery. Diagnosed with breast cancer in 2009 and undergoing surgery and treatments has given her a new meaning to life and all of it's wonders: "Life is good, so enjoy and treasure every moment of it". "I always remember loving Art and Nature; it is a great gift that was given to me, and so by combining two loves of my life I am able to share them both in the art that I produce. I do what I love and love what I do."